Longitude - 101 degree 51' 57.1"
Latitude - 2 degree 25' 18.6"
Coordinate N2.52226 E101.79181 is Port Dickson Chinese Methodist Church and coordinate above is Methodist Center, anyone can confirm ? 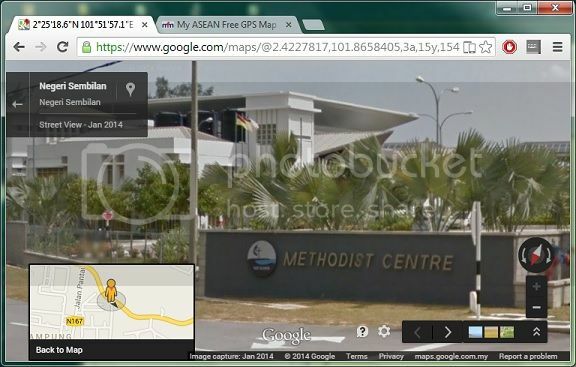 so ben0488's coordinates are not far off for Port Dickson Methodist Centre. Yes, I can confirm it's the PD Methodist Centre. I was there two weeks ago attending a summit. sobamy wrote: Yes, I can confirm it's the PD Methodist Centre. I was there two weeks ago attending a summit. Thank You Bros for confirm this place. Wah malaysia have goole street view this is very goo tool for mapping.